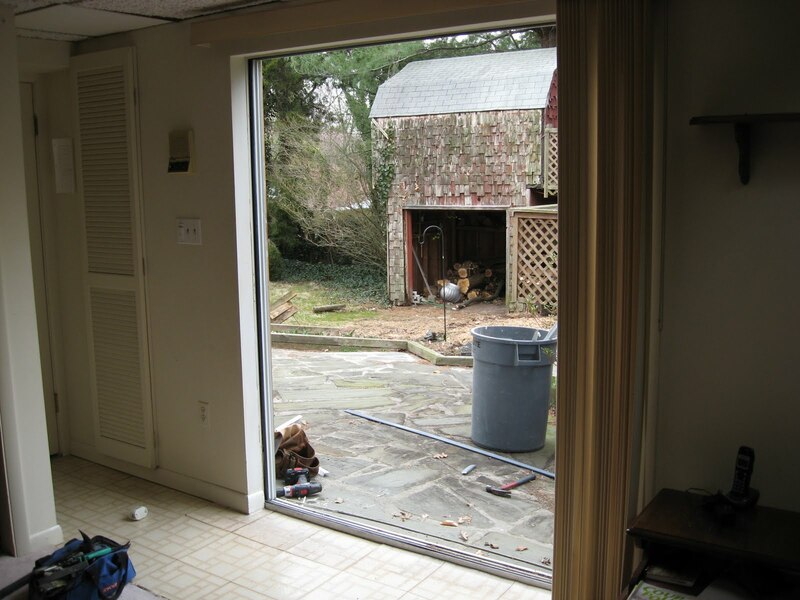 The family room has a sliding glass door that opens up to the patio, but we’ve never been able to use it. It was old and the track was warped, so we couldn’t reliably open or close it. It wasn’t well sealed, either, letting a lot of cold air in over the winter and probably increasing our heating bill quite a lot. I used duct tape ofer the gap, because I couldn’t find the tubes of removable weatherizing caulk that my Mom had given me, and couldn’t find replacements at Home Depot. I have since found the stuff at Kendall Hardware in Clarksville – it’s called “Seal ‘N Peel” by DAP. If you have drafty windows that you won’t need to open during the winter (don’t do fire escape windows, for example), a bead of this stuff along the cracks will do wonders to keep the cold out. In the spring, just grab hold of a loose end and peel it right off. Decorated with duct tape, and its screen hanging on for dear life. 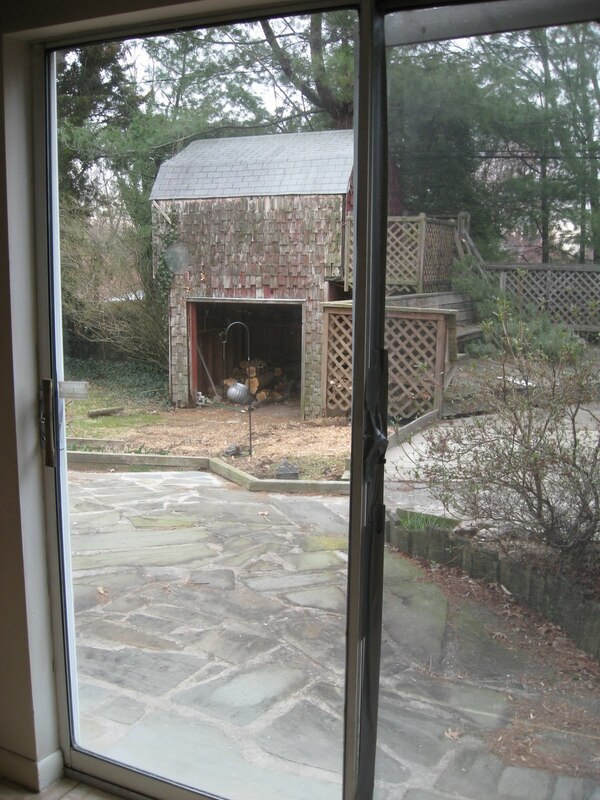 After a ton of research, we opted for a Milgard French-style sliding glass door. It’s supposed to be very energy-efficient, with double paned glass and a coating to reflect some UV light to keep things cooler in summer. My man was very happy about the warranty, which lasts forever and covers almost everything that could happen. The guys showed up and tore out the old door, leaving a gaping hole in our house for a few hours. The cats were fascinated – Mojo even got outside and sniffed around a little, while I kept an eye on him. I got nervous when he got twitchy and went after a bird, but luckily he stayed close to the house. And now: we love our new door. The French-style doors have a wider frame, which I like a lot. the door slides open and closed quietly and smoothly, and the lock and handle are easy to use. We can leave it open on nice days because we now have a screen that slides back and forth and isn’t full of holes. Maybe we’ll have fewer stink bugs inside this year? I need to get used to using this door to go outside, because it was unusable for the first year we’ve been here, and I’m in the habit of going to the sunroom to get to the backyard! I did it twice yesterday. Soon, I’ll replace the old vertical blinds and re-tile that area, and complete the transformation! This entry was posted in Uncategorized on April 4, 2011 by antijen. So now you’re not using duct tape to hold together the house! Damn, Jen, you’re losing your Canadian identity. Now that looks a lot better! 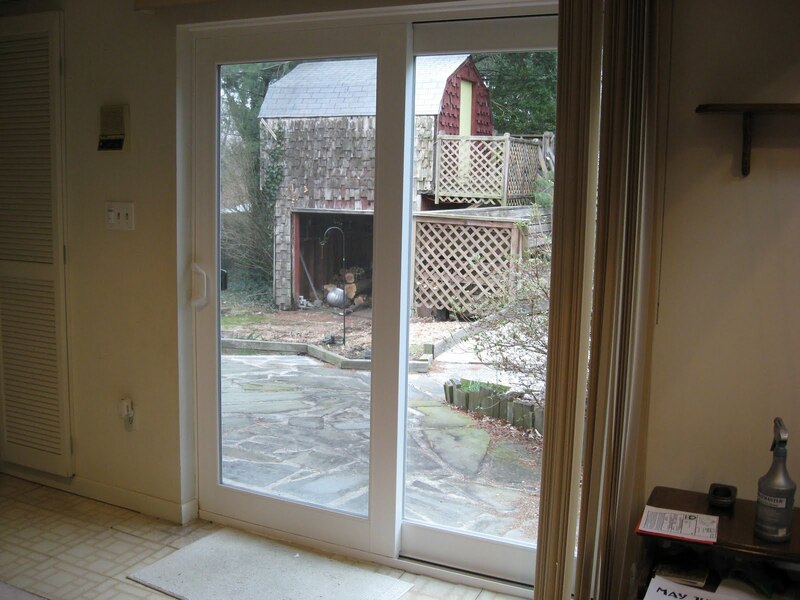 The wider frame of the patio door fits just perfectly, and it will make the whole foundation of the door sturdier. For the replacement of the old vertical blinds, I imagine drapery would look better there. Plus, you can choose what color and style you want if you do decide to put drapes there.